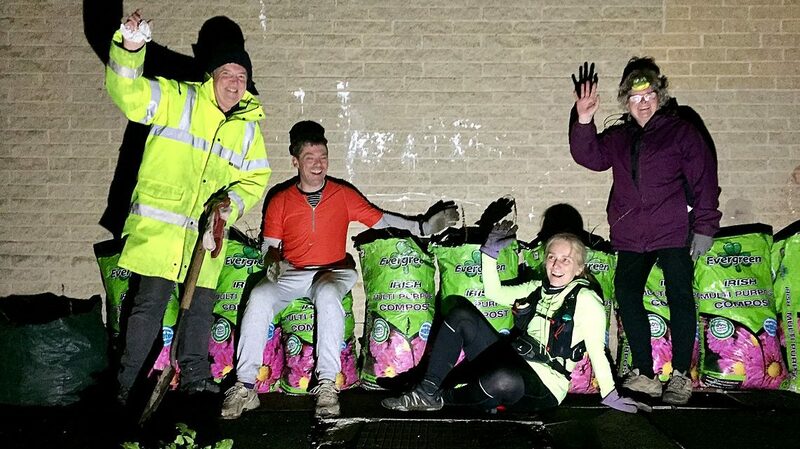 GoodGym kindly ran to Kirkheaton Community Centre on Tuesday evening ‘to do a spot of weeding’. Except that they did a mammoth job – check out those bags!!!!! Last night’s run had caused a little bit of trepidation amongst Huddersfield GoodGymmers. I’m not sure if it was the total distance (8K), the fact the task was taking place in Kirkheaton (at the top of a jolly big hill) or for other reasons entirely, but we were missing a few of our regular runners last night. As it was, Ben Godfrey, Louise Galvin and myself left the Stadium just after 6:30pm for the steady run up to Kirkheaton Community Centre. Head torches meant that we were able to include some off road sections to break up the monotony of the climb up to the village, and with (almost) no complaining we arrived at the Community Centre 3K later definitely warmed up and certainly raring to go. It was great to see Trish from the Community Centre already prepared with tools, gloves, lights and bags, and following a short Health and Safety talk, we were good to go. 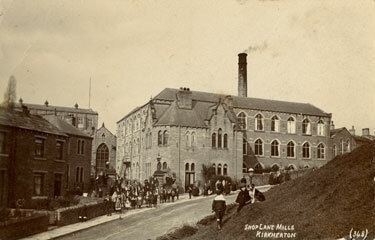 At the back of the Centre is a large tarmac area which I had been mistakenly calling a car park, it turns it the space was actually the playground when the building used to be a school. Anyway many years of under use (as either a playground or car park) has allowed weeds and moss to invade, making the area look unsightly. 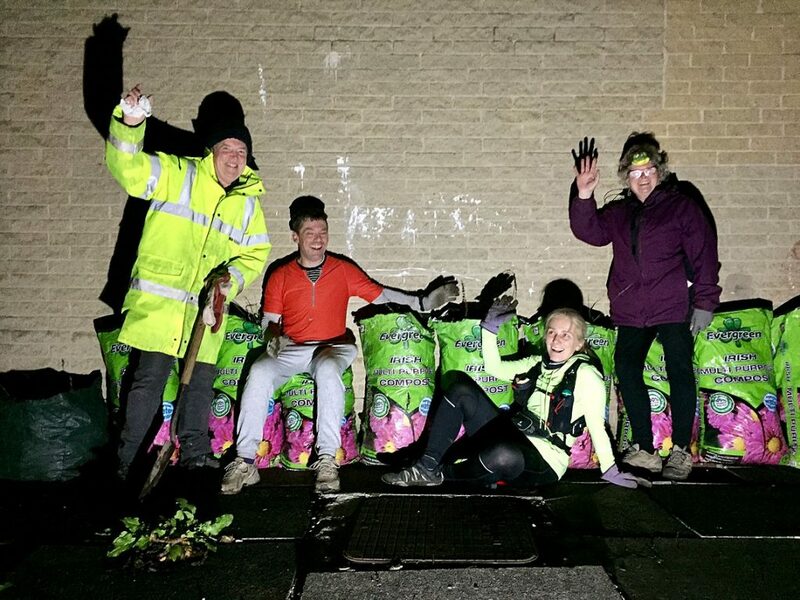 GoodGym’s task was to scrape away this unwanted vegetation and get the area looking more presentable and safer for users of the centre, which is a focal point for the local community. Given there were only 3 GoodGymmers on task this week it was handy to have the help of Trish and Michael from the community centre. As we scraped, shoveled and scooped up the moss, grass and other weeds Trish explained how the work of herself and the other volunteers kept the centre (and it’s associated library) open as a vital resource for local people. 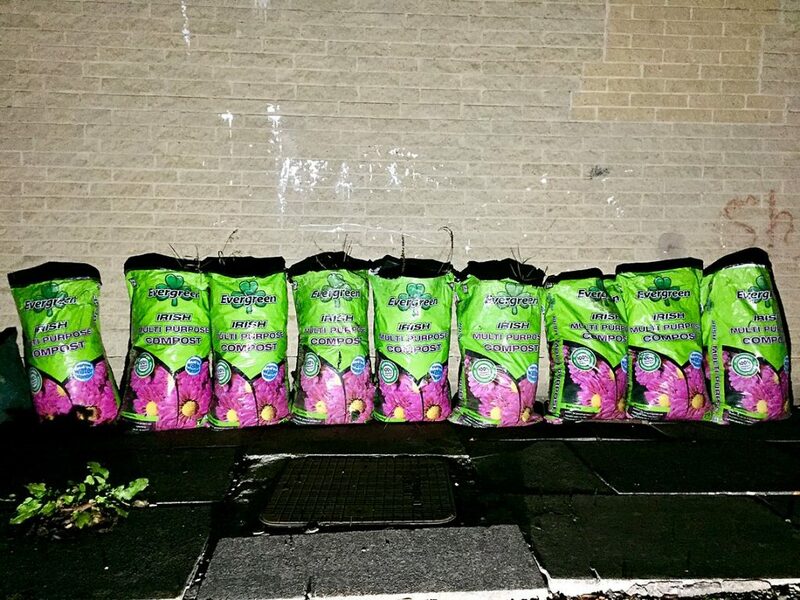 As we chatted we steadily filled more and more compost bags with weeds and lined them up one by one against the back wall of the centre as testament to our efforts. As this was such a big task and we were slightly shorthanded, GoodGym worked a little longer than our usual 45 minute task time, but after an hour we had still only cleared about two thirds of the area. Despite Michael’s best efforts, and attempts to bribe us with coffee and biscuits if we stayed until 9pm , we had to say goodbye to our hosts as we still needed to run almost 5K back to the Stadium, although this was admittedly now mostly downhill. Never wanting to leave a task incomplete however, before leaving we did arrange with Trish that GoodGym would return on another Tuesday evening before Christmas to finish what we had started. Before we ran off there was one thing left to do, and that was of course to get a photo of the ten bags of moss and weeds we had collected in the preceding hour or so. Photos taken it was back to the running, and a return route which took us past Dalton Bank and on a path new to Louise (I always love showing runners new routes!). 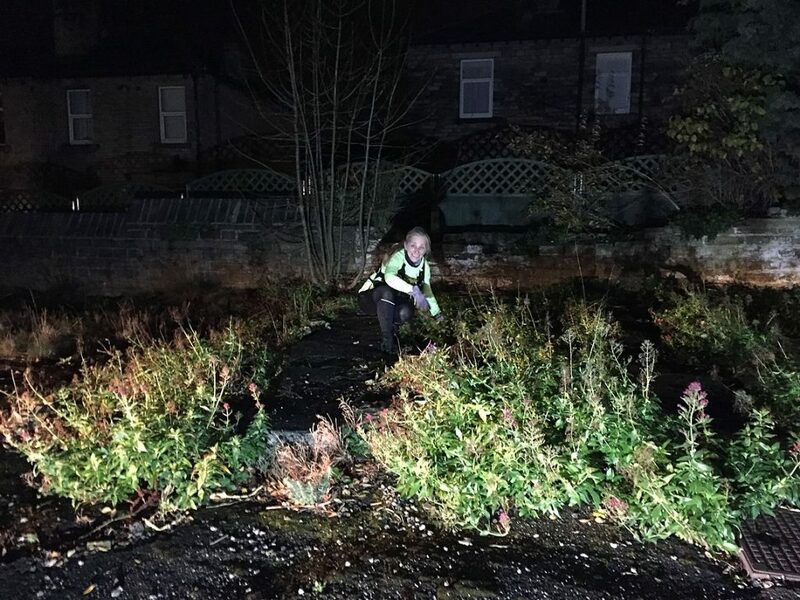 A final kilometer along Leeds Road had us all working hard running at race pace, and Louise even energy enough left for a final lap of the Stadium Car Park to register the run at a full 5K on her Garmin. 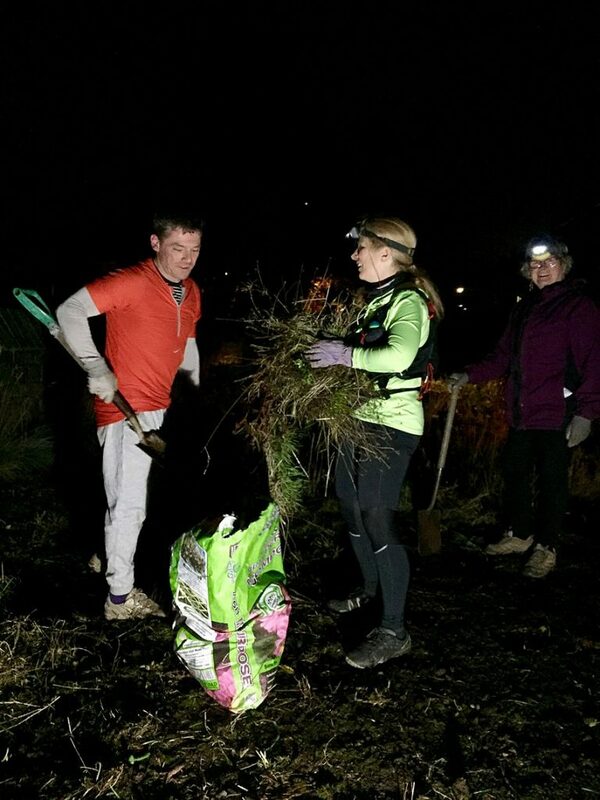 Thanks to Ben and Louise for their assistance last night, and for being prepared to take on both the task and the hill of Kirkheaton. Another cracking night for running and another good GoodGym job done. Cheers guys! Thanks also to Louise for the title of this week’s run report.